Any passive driving-point impedance, such as the impedance of a violin bridge, is positive real. Positive real functions have been studied extensively in the continuous-time case in the context of network synthesis [68,524]. Very little, however, seems to be available in the discrete time case. This section (reprinted from ) summarizes the main properties of positive real function in the plane (i.e., the discrete-time case). We now specialize to the subset of functions representable as a ratio of finite-order polynomials in . This class of ``rational'' functions is the set of all transfer functions of finite-order time-invariant linear systems, and we write to denote a member of this class. We use the convention that stable, minimum phase systems are analytic and nonzero in the strict outer disk.C.8 Condition (1) implies that for to be PR, the polynomial coefficients must be real, and therefore complex poles and zeros must exist in conjugate pairs. We assume from this point on that satisfies (1). From (2) we derive the facts below. since the zeros of are isolated. Corollary. In equation Eq. (C.80), . This is a general property of stable, minimum-phase transfer functions which follows immediately from the argument principle [297,326]. This really a convention for numbering poles and zeros. In Eq. (C.80), we have , and all poles and zeros inside the unit disk. Now, if then we have extra poles at induced by the numerator. If , then zeros at the origin appear from the denominator. Since the poles of and are the same, it only remains to be shown that re . Definition. A Schur function is defined as a complex function analytic and of modulus not exceeding unity in . 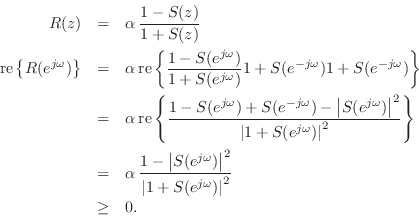 is a Schur function if and only if is positive real. By the maximum modulus theorem, takes on its maximum value in on the boundary. Thus is Schur. If is constant, then is PR. If is not constant, then by the maximum principle, for . By Rouche's theorem applied on a circle of radius , , on which , the function has the same number of zeros as the function in . Hence, is minimum phase which implies is analytic for . Thus is PR. for re , where is any positive real number. where is any positive real number. The class of mappings of the form Eq. (C.85) which take the exterior of the unit circle to the right-half plane is larger than the class Eq. (C.86). For example, we may precede the transformation Eq. (C.86) by any conformal map which takes the unit disk to the unit disk, and these mappings have the algebraic form of a first order complex allpass whose zero lies inside the unit circle. 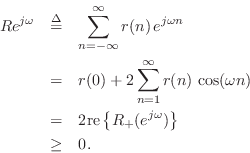 Riemann's theorem may be used to show that Eq. (C.89) is also the largest such class of conformal mappings. It is not essential, however, to restrict attention solely to conformal maps. The pre-transform , for example, is not conformal and yet PR is preserved. 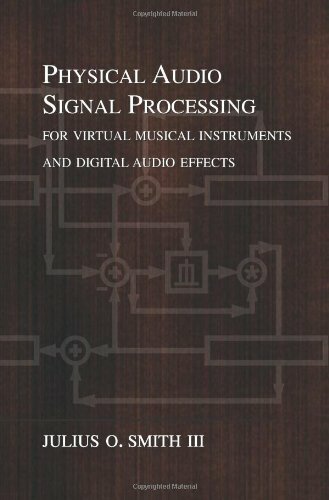 The bilinear transform is one which is used to map analog filters into digital filters. Another such mapping is called the matched transform . It also preserves the positive real property. Property. is PR if is positive real in the analog sense, where is interpreted as the sampling period. These transformations allow application of the large battery of tests which exist for functions positive real in the right-half plane . The sum of positive real functions is positive real. The difference of positive real functions is conditionally positive real. The product or division of positive real functions is conditionally PR. PR not PR for . If all poles and zeros of a PR function are on the unit circle, then they alternate along the circle. Since this property is preserved by the bilinear transform, it is true in both the and planes. It can be viewed as a consequence of the phase bounds for positive-real functions. 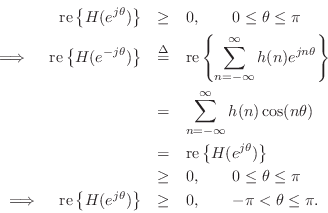 If is PR, then so is , where the prime denotes differentiation in .